When we moved back to our roots in the Pacific Northwest on retirement, one of our longterm goals was met when we acquired a 40-foot tri-cabin trawler, the Pacific Voyager. Although 20 years old and challenged with décor out of the early seventies, this single engine Pelagic hull vessel was sound and would provide us with a platform for exploring the remote reaches of British Columbia and Southeast Alaska. As a student I had spent my summers working in remote areas along the coast and I knew that the only way I could share this spectacular scenery with my wife was to go boating. It was an easy decision for me, but for Noreen, it would be a new experience that could go either way. Fifteen years after purchasing Pacific Voyager, we succumbed to “two-foot-itis” and moved aboard a 42-foot Krogen pilothouse, Pacific Sapphire. Built in 1988, she was in top shape. After a shakedown cruise that summer around the open coast of Vancouver Island, we decided we were comfortable without the paravane stabilizers we’d had our previous vessel and we headed for Southeast Alaska in 2007 to participate in a basketry course; by late June we would be free to head farther north and revisit friends and places we’d cruised aboard Pacific Voyager. When we turned south from Sitka in mid-July, we knew we would again be able to visit some of our favorite anchorages: the “Holes in the Wall” along the west side of Prince of Wales Island. The name “Hole in the Wall” conjures up an image of a remote and special place. While growing up in Vancouver, when I heard mention of “Hole in the Wall” it was in reference to the swift-current passage south of British Columbia’s Sonora Island, a route we have occasionally used between Okisollo and Calm Channels. Although anchorage can be obtained in Florence Cove, this Hole in the Wall is used primarily as a passage, and it was not until we visited Southeast Alaska in 1994 that we again encountered a destination called “Hole in the Wall.” In fact, United States Coast Pilot 8, which coves Southeast Alaska, lists four different places bearing this name (three of them with slightly different punctuation or capitalization.) Two of these are charted locations while the other two are local names. Since we planned to travel down the west coast of Prince of Wales Island where three of the four Holes in the Wall are located, this southbound leg of our trip became known as “Destination Hole in the Wall.” We would revisit two, very special, charted anchorages—one on Prince of Wales Island and the second, farther south on Dall Island’s west coast—and add a third destination, known locally as “Hole in the Wall” that lay midway between. The fourth listing we found, “Hole-in-the-Wall,” refers to a local name for a small boat harbor east of Ketchikan and, as this one lacked the intrigue, we did not incorporate it into our itinerary. About 7 miles south of Port Protection, there is a narrow gap in the rocky wall that leads into the first Hole in the Wall we would visit on this trip. The gap appears almost out of nowhere. The channel into this anchorage is 0.65 nautical mile long. About 0.2 nautical mile inside, there is a 12-fathom sounding; hence, a minus 2.4-foot tide leaves less than 6 feet of water, so it is best not to enter or exit on a minus tide. Also, there is a fair tidal flow on both the ebb and the flood, so, on your first time into this jewel of an anchorage it is best to enter at high water or against a slight ebb so you can maintain steerage and travel dead slow with a bow lookout. The soundings are generally accurate (NOAA chart no. 17378) although there are two rocks along the north shore of the channel, only one of which is charted. The rock just inside the entry is marked on the chart. A second rock, unmarked, lies in the region between the two 22 soundings. A midchannel course is clear other than some bull kelp in the area marked 12 fathoms. and inside there is ample swing room for several vessels. Avoid the shallows off the river mouths at the back of the bay. 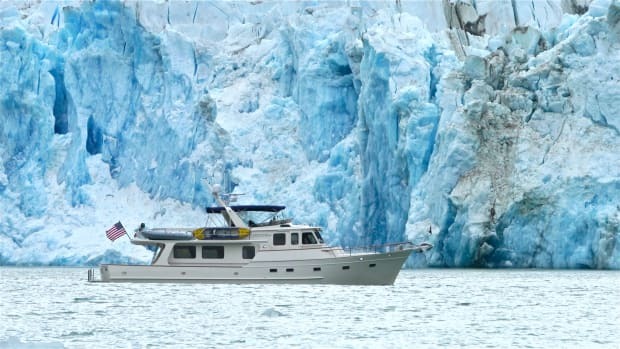 This anchorage is a good base from which to fish, explore, and view wildlife. Just outside, we were surrounded by humpbacks feeding while we fished for salmon to the north, along the Labouchere Islands. Deer, bear, otters (sea and river), mink, and a myriad of birds can be seen feeding in this “Hole” and wildflowers, wild berries, goose tongue greens and samphire (sea asparagus) can be found along the shores. During one five-day stay in late June we were alone except for a brief visit by a small skiff that dropped off two bear hunters at the northern river delta on the last day of the hunting season. They were unsuccessful. The next day, a large bear made its appearance in the precise area they had been, and we applauded. Somehow, one gets the feeling that the bears keep a day-timer, as we had seen very few bears before the close of the spring bear season. On a previous visit, we watched a sow explore the beach at low tide with her three cubs, grunting instructions to the exuberant triplets. What a treat! 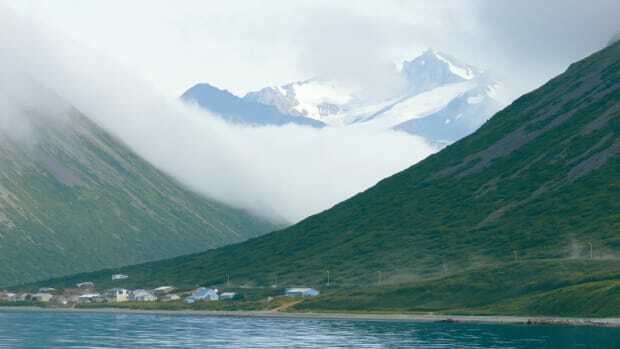 Heading south from this delightful anchorage, we took the sheltered inside route entering through Shakan Strait into El Capitan Passage, the dredged channel behind Kosciusko Island. This passage, including Dry Pass, is best transited by smaller vessels on a rising half tide, when you can see the tailings piled up by the dredge along the sides of the channels. It’s recommended that you make a Securité call before entering, because some “pocket” cruise ships use this route. The route through Tuxekan Passage and Tonowek Narrows (watch for the totem on the south end of the small island along the west side) takes you into Tonowek Bay and the Gulf of Esquibel, where the second Hole we visited is located. This narrow passageway between the two San Lorenzo Islands is locally known as “Hole in the Wall.” It has served as a secure anchorage for the salmon trolling fleet for many years, and before their time it was a native summer fishing camp. Today it provides a secure spot for the local fish packer to collect the silver bounty from the fleet. In years past, there were numerous tents and a few cabins along the east shore, where the hand trollers set up summer camps. However, this past summer, only a single tent was evident; most trollers now live aboard during the fishing season. Some pleasure boaters would view this as too busy a spot to anchor, but for us, it had a focus and vitality that constantly change and provides a lesson in the lifestyle and commitment of the trolling fleet. As we approached the San Lorenzo Islands from the east, we encountered numerous commercial trollers and sportboats fishing along the shore. It was 9:55 a.m., so we joined in with our fishing lines (using barbless hooks) and promptly had a double header with two robust and active king salmon, which we released because we had not purchased a King Salmon Stamp. Not only were the fishermen busy; a group of six to eight humpbacks was feeding in the same area. Within minutes, we had more coho salmon than we could eat. Fortunately, we had our pressure canner and jars so we continued to fish. By noon we headed in with enough to fill our canner at least twice! The entry into the Hole in the Wall between the San Lorenzo Islands is straightforward in summer, as heavy Macrocystis kelp marks the charted rocks. Favor the west shore at the entry and then keep to the east past the first bay to avoid the midchannel kelp patch and rock. If you are using electronic charting, there appears to be an error in the Horizontal Datum reference offset on the NOAA chart, and it is a good idea to look out the wheelhouse windows and not rely on GPS positioning, even with WAAS differential correction. We anchored just north of the single, kelp-marked rock depicted as a “+” on NOAA chart no. 17404 where we were the only boat until about 3:00 p.m. when the fleet began to trickle in. By dusk there were 14 vessels at anchor, and six to eight secured to a float out of sight behind one of the islets. One might expect noise, but these are not the freezer trollers with engines running 24 hours a day. This is the home for a mix of “hand trollers” (two hand-cranked gurdies) and “Power Trollers” (maximum four power gurdies) and they all rely on the packer and ice to keep their fish fresh for market. Their day starts early; I watched one leave in the pre-dawn light at 3:30 a.m. and by 6:00 a.m. we were again alone. Although the bottom is rocky, this anchorage is secure in all but a strong southeaster. When this comes, boats seek shelter at the float maintained by the local fish packing company (Craig Fisheries) or in one of the two bights on the north shore of east San Lorenzo Island. During a five-day stay, we made several excursions beachcombing, halibut fishing and more salmon fishing. While at anchor, we watched humpbacks blow and breach in the gaps to the north and south, and sea otters and sea birds were constant visitors. When the trollers returned at day’s end to clean their last haul, the eagles were ready and to swoop in for their free meal. This was a great photo opportunity; the eagles have become accustomed to snatching entrails from close aboard. As with all remote stopovers, there comes a time to move on and we wanted to supplement our diet of fresh fish with produce, so we headed into the town of Craig. Here, you can refuel before proceeding farther south. We had another 200 miles before crossing back across the Alaska border and clearing Canada customs in Prince Rupert, B.C. With fresh provisions and settled weather, we beachcombed our way gradually down the west side of Baker Island and fished Cape Bartolome to replenish our supply of fresh salmon before we rounded Cape Felix and headed for the third Hole in Diver Bay on the west side of Dall Island. On a previous stop here we were buddy boating with a 53-foot Alaskan and approached Divers Bay from Craig via the inside route down Meares Passage to avoid a lump that was running in from the southeast. Here is the one and only Hole in The Wall (note the capital “T”) detailed on NOAA chart no. 17407. The narrow, short (150-yard), deep (4-fathom minimum) passage through the rock wall blocks most of the swell and leads to a mud pocket with ample room for several boats. There is a 1/2-fathom patch in Diver Bay on the approach to this anchorage that is usually kelp covered and can easily be seen. When reading the United States Coast Pilot, you might expect this shallow area to be in the entry, but it is in fact well outside and clearly marked on the chart. Enter down the middle of the passage and favor the north shore at the inside of the narrows, as there is a reef that extends a short distance into the bay. Most of the channel is about 6-1/2 fathoms; the depth decreases to about 4 fathoms at the inner end of the channel before dropping back to 6. In settled conditions you can anchor anywhere, but a residual swell does enter and you can shelter from this and the afternoon breeze just to the south of the entrance. Although this “Hole” is on the open coast and perhaps not every boater’s cup of tea, if you watch the weather, the under-5-mile run down Meares Passage to Diver Bay is well worth since there are often humpbacks feeding throughout the area. Again, in the tranquility of this remote Hole we have watched deer and bear graze the beaches while, through the entry gap, we could see surf explode over the outer Diver Islands. If you have a suitable dinghy and cooperative weather you may be able to explore the curving sandy beaches of Arena Cove on the south of Suemez Island. Surf is almost always present from the prevailing southwesterly swell, landing on these beaches requires some skill, and you should carry a waterproof VHF radio for safety. Southeast-facing sandy beaches are rare on this outer coast of the Alaskan Panhandle, and the collection of drift will amaze you. On this trip we spent three nights at anchor here, beachcombing and developing recipes with the fresh huckleberries and blueberries. On previous visits, the weather forecasts indicated prudent mariners should seek the sheltered route back through Meares Passage to Tlevak Narrows before heading south. But with settled weather predicted for the next few days, we felt that the time was right to turn south down the open coast of Dall Island. We spent three more days with tufted and horned puffins and long strings of rhinoceros auklets, murres, and murrelets along the rugged west side of Dall Island. We made stops in Sea Otter Harbor and Port Bazan and then rounded Cape Muzon with the seabirds. 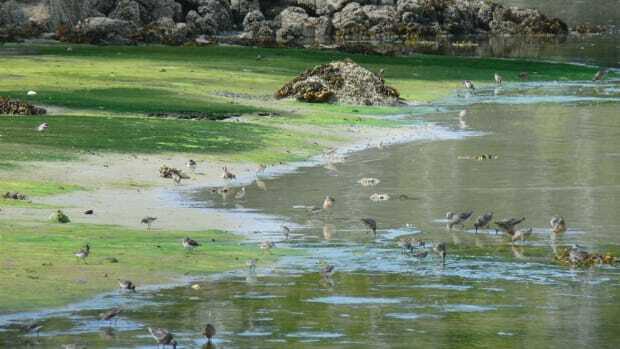 While the birds paused in the active tidal swirls to feed for the day, we sought shelter farther north, on the east side of Long Island in Cordova Bay. From here we would work our way south through the Barrier Islands and east to Nichols Bay before crossing back into Canadian waters and clearing customs in Prince Rupert. As with most trips to the Pacific Northwest coast, it is important to have plenty of spare time and to not feel rushed. On separate trips we have spent as long as six weeks exploring this region, although a more direct trip in Ketchikan and ending in Prince Rupert (a distance of about 325 nautical miles) can be comfortably completed by most displacement-speed trawlers in two weeks. 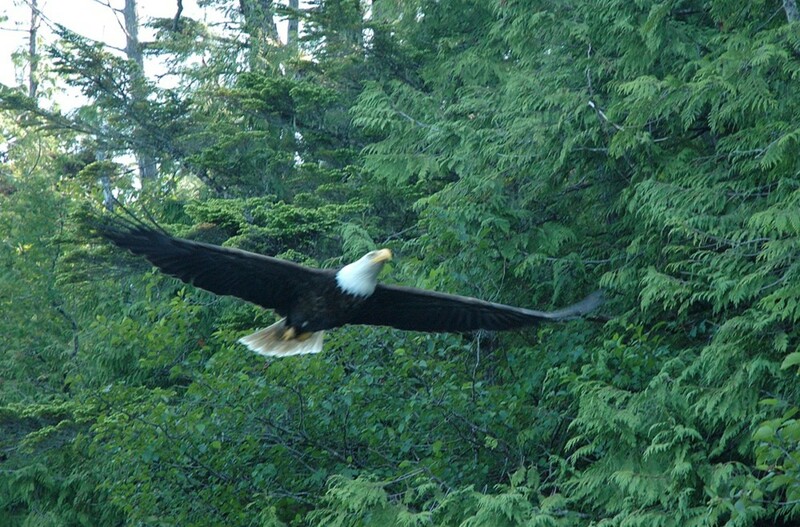 A good midway stop is the area of Craig and Klawock, about 150 nautical miles from Ketchikan. These towns are accessible from Ketchikan by air or by road and ferry and would be a suitable place to meet up with friends. We have learned to only meet friends at a port where there is a hotel or where they can use a floatplane service to fly to our location so no one is inconvenienced by weather delays. Though we still had well over 500 nautical miles to go before we could tie up at our slip in the Fraser River near Vancouver, our trip exploring the Holes in the Wall of Southeast Alaska had come to an end, and we paused to reflect on our travels. Would we visit these out-of-the-way places again? Absolutely. But we’ll leave it for another year, when we will again be drawn to the tranquility, beauty, and breathtaking wildlife on the remote west side of Prince of Wales Island.